There are two major creeks in our area with misleading names. One Mile Creek is about Seven miles long. Four Mile Creek is about Ten miles long. 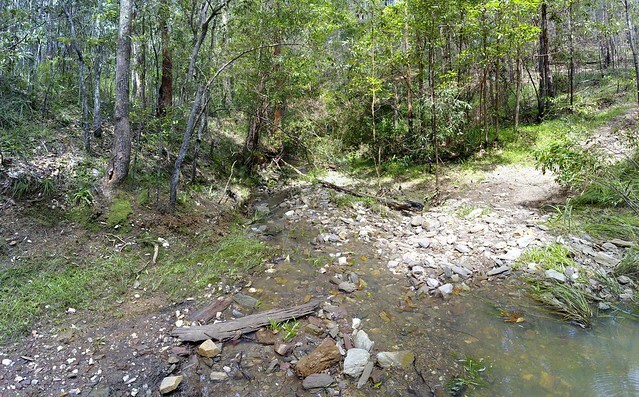 Both creeks have their source in the beautiful bushland of Clear Mountain. Here’s some pictures of my ride through Clear Mountain and over the upper reaches of One Mile Creek. This is the trail head of one of my favourite rides through Clear Mountain. 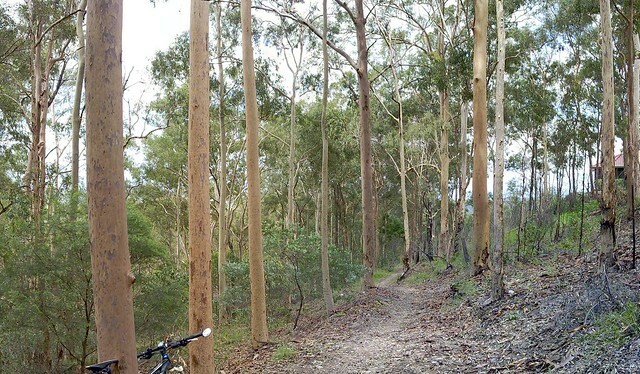 Starting at the top of the mountain near Old School Road, Centre Road winds steeply down the hill through the eucalypts to a few crossings over One Mile Creek. There are lots of trees, lizards and no sounds except bird calls and wind through the leaves. It’s a great place to ride, and I’m so glad most of it is a state forest reserve. The crossings over One Mile Creek have created some steep banks which are challenging to cycle in and out of, but are always enjoyable. Leith, thanks so much for this information. It all makes sense now. I’ve added a map (above) which shows the distances from Gordons Crossing of each of these creeks as they crossed the Old North Road, and the distances are almost spot-on. Do you think naming the creeks based on their distance from Gordons / Raymonts Crossing implies that crossing the North Pine river was a major milestone on a trip up the Old North Road in the 1840’s? Yes, the North Pine River would have been a major landmark and sometimes proved to be hazardous to travellers. The Archer brothers from Durundur, with the assistance of Evan Mackenzie from neighbouring Kilcoy, blazed the trail which became the Old North Road in 1842. On the return journey from Brisbane, their heavily laden dray became “embedded up to the axle in a swamp” near the crossing, undoubtedly the first of many such incidents. In later times, teamsters would rendezvous at the crossing so they could double-bank their teams to haul their loads out of the North Pine River valley. After the establishment of Whiteside and Samsonvale in 1843 and 1844 respectively, the turnoff to these runs, not far from the north bank of the river, would also have been a major milestone. The first track to the Upper North Pine (Dayboro district) also passed by the headstations of both these runs, as the present Dayboro Road was not opened until later. There is a body of opinion which suggests that the Old North Road may have been a well-established Aboriginal pathway prior to the arrival of the first squatters.